There’s something magical about historic European cities in winter. A dusting of snow, twinkly lights, crisp chilly nights and the smell of glühwein and Christmas biscuits make everything seem extra special. So when Jet2Holidays asked me to try out one of their city break packages, I couldn’t resist a wintery weekend in Salzburg. I usually plan and book everything separately, and don’t think I’ve done a package holiday since I was 21 (Faliraki – don’t judge! ), but there was something so nice about having everything organised for us. All we had to do was just turn up and enjoy ourselves, and Salzburg was a great place to do it, overflowing with festive sparkle. 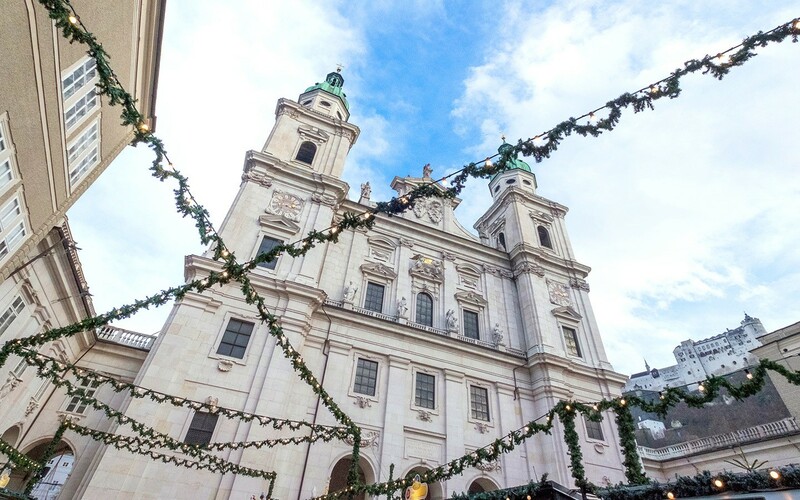 So here are some of my favourite things to see and do in Salzburg in winter. 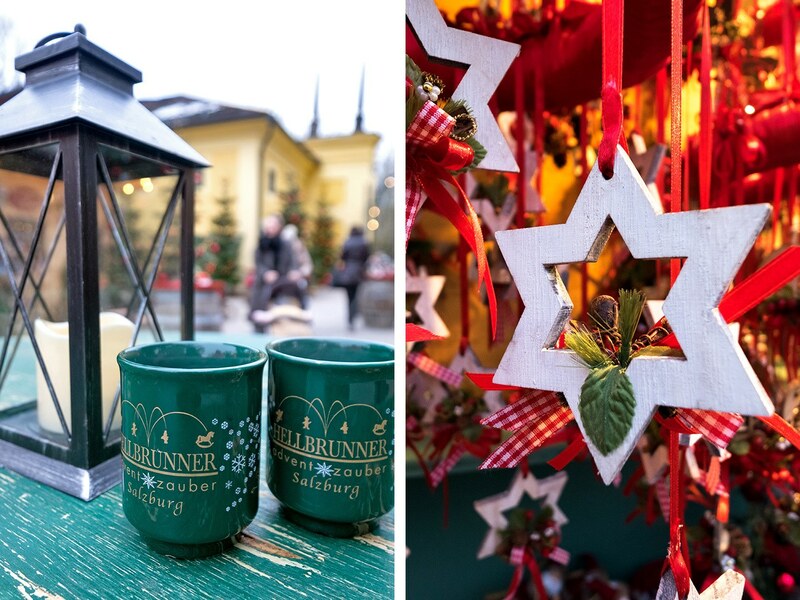 Europe at Christmas means one thing – Christmas markets. It seems like there’s hardly a city left in the whole continent that doesn’t have one now, but Germany and Austria got there first – and they do it best. Think wooden chalets draped with lights selling wood carvings and glass tree decorations, cosy hats and gloves, candleholders, gingerbread biscuits, cheese, glühwein and punch. At most markets you pay an extra couple of euros as a deposit for a special glühwein mug which makes a good souvenir to take home. 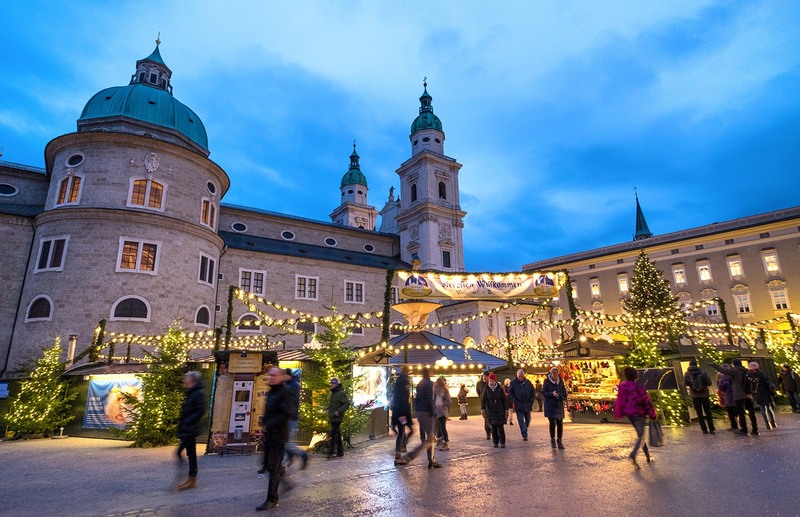 The Christkindlmarkt in Dom Square is Salzburg’s biggest market, but there are lots of smaller markets tucked around the city too. Check out the sidestreets running off the main shopping street Getreidegasse as well as behind the Mirabell Palace and outside the Sternbräu brewery. Beyond the city centre, prices tend to be a bit lower – Hellbrunn Palace’s market had lots of lovely handcrafted gifts, or you can take the boat between the villages of St Gilgen, St Wolfgang and Strobl which each have their own markets (Kelly at Around the World in 80 Pairs of Shoes has a great round up of the markets in and around Salzburg). You can’t go far in Salzburg without coming across the city’s most famous son – Wolfgang Amadeus Mozart (though it turns out Amadeus wasn’t even his real name!). Mozart was born in Salzburg in 1756 and lived there for 20 years, and there are two different Mozart houses to visit. First is Mozart’s Birthplace in an apartment on Getreidegasse, where you can see the rooms he lived, worked and even was born in, as well as his letters and first violin. Then there’s the Mozart Residence on Makartplatz Square where his family moved to in 1773 – a lot grander with eight rooms and own concert hall where young Mozart (and his almost equally talented sister) used to play. 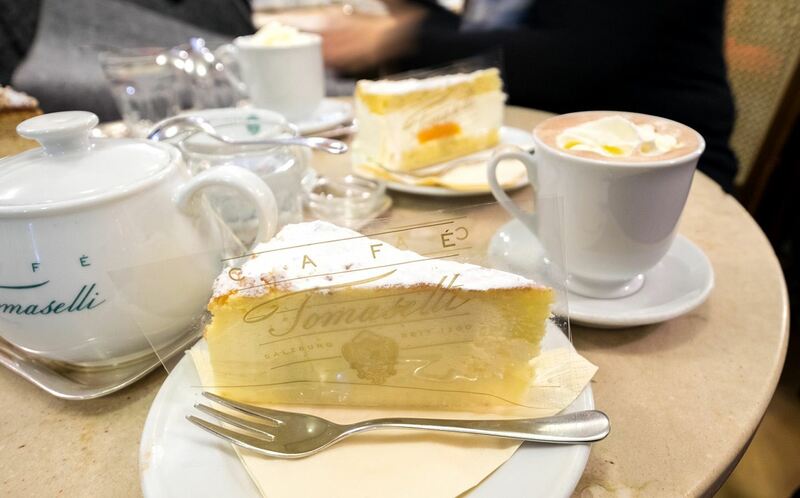 We also called in at Café Tomaselli, a regular haunt of Mozart’s, for coffee and cake – though if you want to really be authentic his favourite almond milk is on the menu too. There are lots of different Mozart concerts in Salzburg – from the opera house to Hohensalzburg Fortress – but we went for a dinner concert at the Stiftskulinarium. It’s the oldest restaurant in Europe, dating back to 803. 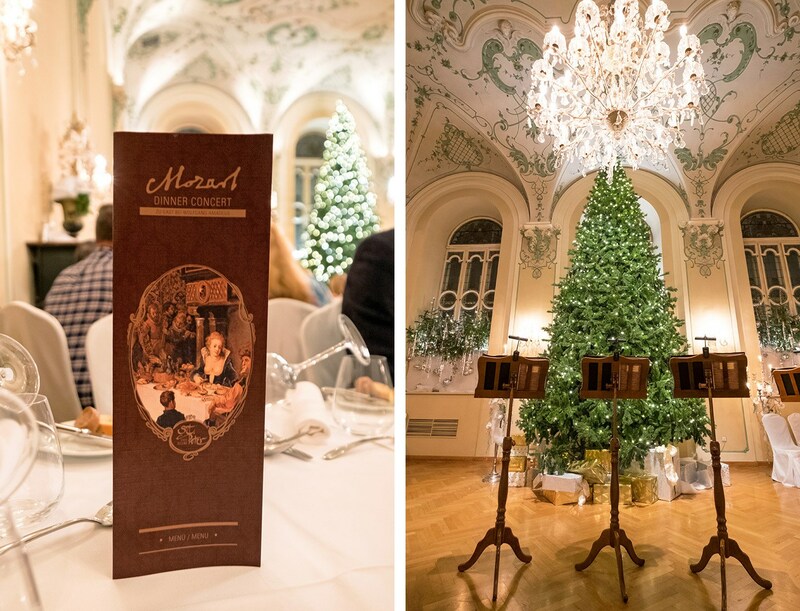 Their Baroque concert hall is lit by candlelight and you’re served dishes from Mozart’s time. A giant Christmas tree and twinkling lights made it look extra beautiful – and between each of the four courses we had a taster of Mozart’s music from The Marriage of Figaro, Don Giovanni and The Magic Flute. And of course we couldn’t leave Salzburg without bringing some Mozart chocolates home. There are different versions all around town, but the original pistachio marzipan balls in dark chocolate come from the tiny Konditorei Fürst shop – you can tell them apart by their blue and silver wrappers instead of the usual red. The Sound of Music is as much of a British Christmas tradition as the Queen’s Speech and giant boxes of Quality Street. A lot of the film’s exterior scenes were shot in and around Salzburg (with a little help from Hollywood), so you can follow in Julie Andrews’ footsteps. If you’re a real Sound of Music fanatic, there’s a tour around the locations, but it’s also easy enough to visit the main ones on your own. In the Mirabell Gardens you’ll find the steps where Maria and the Von Trapp children sang ‘Do-Re-Mi’. Schloss Leopoldskron, just outside the city centre, was used for the family’s house. 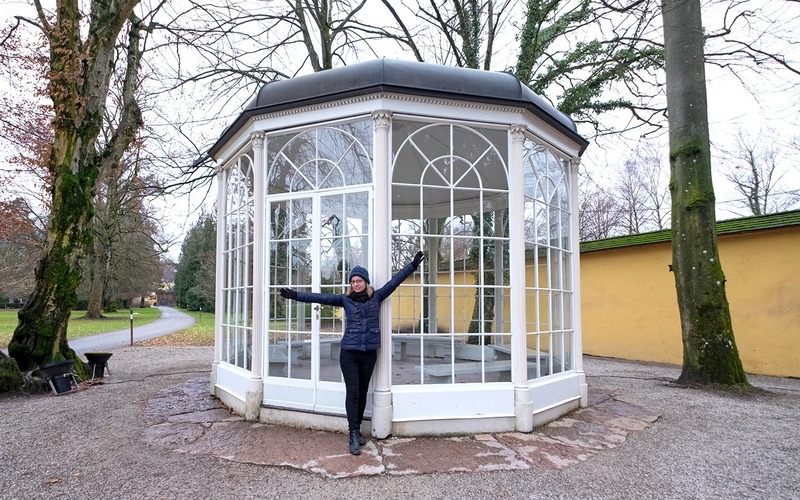 The pavillion from ‘Sixteen going on Seventeen’ is in the gardens at Hellbrunn Palace. ‘I Have Confidence in Me’ was shot in the Residenzplatz. And the Felsenreitschule concert hall is where the family played their final concert before escaping. 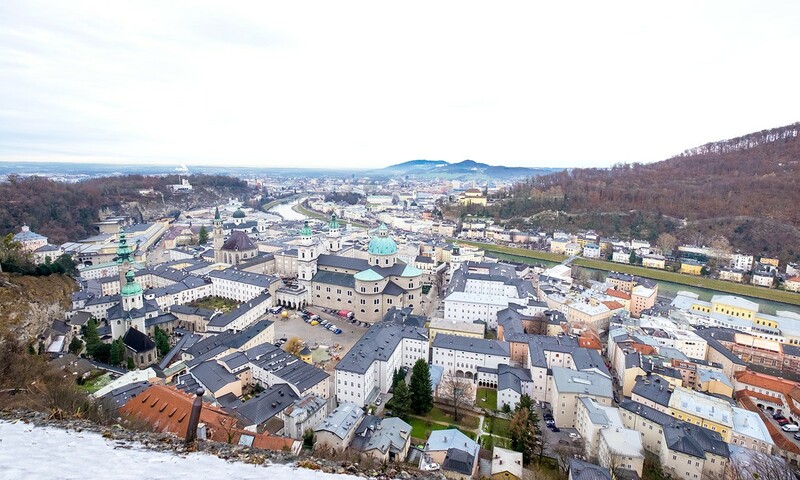 Salzburg is surrounded by three hills, so you don’t need to go far to get a bird’s eye view over the city from all angles. The Hohensalzburg Fortress towers over the city and it’s an easy ride to the top on the funicular railway. It’s almost a whole mini town up there with a church, old houses and shops, and a terrace which overlooks Salzburg’s rooftops and church domes. There’s also the Kapuzinerberg mountain on the one side of the river and the hilltop Museum of Modern Art on the other. In the city centre you get a great view of Dom Square and the Christmas markets from the DomQuartier Museum. 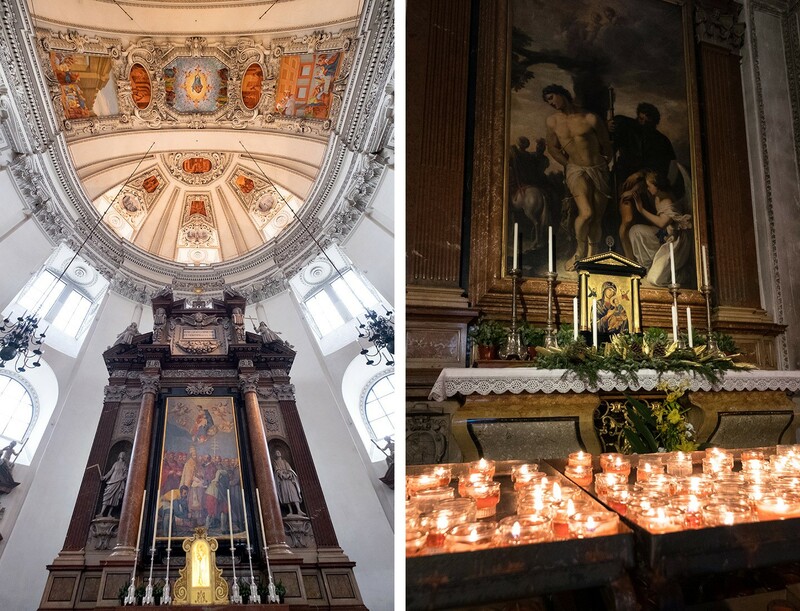 It’s actually five small museums in one, with the lavish staterooms of the archbishops’ palace and a panoramic terrace connecting it to Salzburg’s cathedral, so you get a bonus extra view down into the cathedral nave from the gallery. 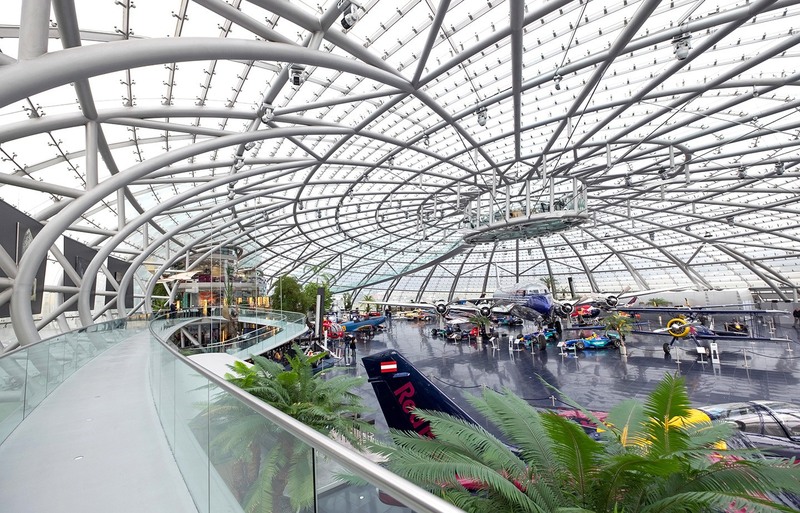 For something a bit different – especially on a rainy day – head just outside central Salzburg’s to Hangar 7, next to the airport. This unique steel and glass dome couldn’t be any more of a contrast to Salzburg’s fairytale architecture. It was built to hold Dietrich Mateschitz’s collection of cars and planes, the Austrian entrepreneur who co-owns Red Bull. So there are Formula 1 cars from the Red Bull and Torro Rosso teams on show, as well as aircraft used by the Flying Bulls aviation team who take historic planes and helicopters and restore them in next-door Hangar 8. If you love planes you’ll love this place, and the building is definitely worth seeing – there are a really good restaurant and a bar overlooking the airport runway too. Our Salzburg city break with Jet2Holidays cost £335 per person, including checked bags and four nights bed and breakfast in a four-star hotel. We flew with Jet2 from London Stansted to Salzburg and I was impressed with the leg room (the curse of being long-thighed!) and friendly service on board – and that we managed to arrive in Salzburg on time despite the UK being bombarded by snow as we flew out. Their baggage allowance is generous too with 22kg for checked bags and 10kg for hand luggage, and flight times weren’t too early. 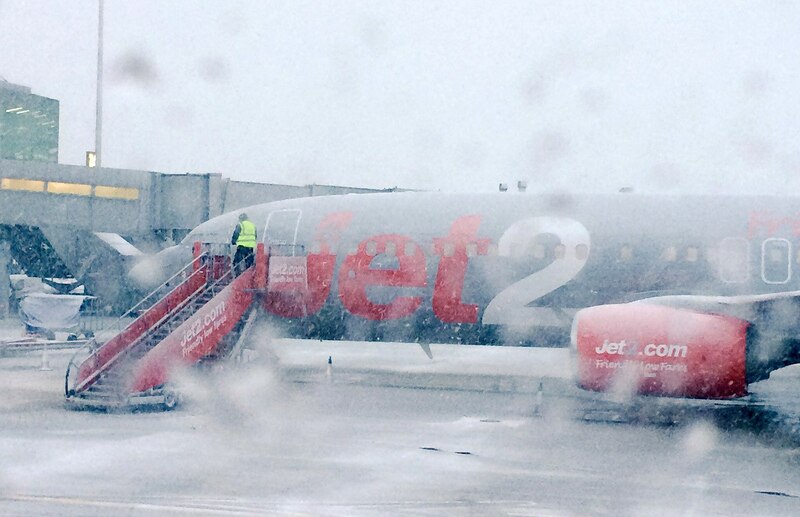 Jet2 fly from nine airports across the UK to 55 destinations across Europe as well as New York. We stayed at Hotel Villa Carlton, close to the Mirabell Palace and about 10 minutes’ walk across the river to Salzburg’s historic centre. The historic building has 39 rooms with lots of quirky artwork and design touches – and was warm and cosy despite the chilly temps. A continental breakfast was included in our package (normally €16 per person) with ham, cheese, bread, pastries and juices. There’s also a bar area in the foyer. If you’re arriving early do beware you can’t check in before 2pm, but they do have a luggage storage room (though it’s not locked so keep your valuables on you – or I left my laptop in their safe). Have you ever been to Salzburg? Do you have any other must-sees to add? Big thanks to Jet2Holidays for hosting me and to Visit Salzburg for arranging my tours and providing a Salzburg Card. All views and opinions are, as always, my own.